KWV (Koöperatieve Wijnbouwers Vereniging van Zuid-Afrika Bpkt) is one of the leading wine and spirits producers in South Africa and has a distinguished heritage, celebrated around the globe, of product innovation and exceptional brands. These include Roodeberg, KWV Wines & KWV Brandies, and Laborie. KWV has grown into a global producer of over 100 products. Bouquet: Red berry, mulberry and blue berry characters are the primary notes to emanate from this rich and flavourful Pinotage. There are subtle nuances of wood spices and dried herb aromas too. The palate is seductively soft and juicy, with silky tannins and a long, gentle finish. Food suggestions: Fillet, beef or risotto dishes are ideal culinary partners to this wine although it is just as fine when savoured by itself. This uniquely crafted Pinotage has distinctive mocha, dark chocolate and coffee flavours that are complemented by blueberry aromas. On the palate the wine is soft, juicy and fleshy, with an upfront sweet fruit element, well-integrated tannin structure and lingering finish. Exudes aromas of blueberry and upfront red cherries and berries. The wine is soft and elegant, with subtle fruit sweetness on the palate and a velvety tannin structure, yet remains juicy with a refreshing and lingering finish. Exudes aromas of cassis, dark berries and Christmas cake along with nuances of dried herbs and cedar oak. The palate shows lovely structure, juiciness and flavours of red fruit and spices. Enjoy this wine on its own or serve grilled meats, casserole dishes or barbeques. Shows upfront mulberry and raspberry aromas with notes of white pepper, dried herbs and ripe fruit. The palate is juicy, with an angular tannin structure and a velvet, lingering finish. Enjoy this wine with any red meat dishes, grilled chicken or a variety of hard cheeses. Bouquet: An elegant red wine with upfront blackberry, plum, black cherry and raspberry aromas complemented by subtle hints of chocolate, caramel and cedar spice. Tasting notes: The palate is balanced, soft, fresh and juicy with integrated silky tannins. The wine is vibrant and layered on the palate, with hints of rose petal and a lingering, fruity finish. This wine has been blended to perfection to ensure freshness and maximum varietal expression. Ageing potential: Enjoy now, but the wine has the potential to be enjoyed 3 - 5 years from vintage. Blend information: 41% Cabernet Sauvignon, 32% Shiraz, 18% Merlot, and 9% other varietals (Ruby Cabernet, Cabernet Franc, Petit Verdot, and Tannat). The palate is lively and juicy with a crisp acidity and zesty, lingering finish. This elegantly styled Chardonnay shows litchi, peach and lime aromas on the nose, complimented by biscuit and orange blossom undertones. Lime and biscuit flavours are carried through on the palate. This wine’s crisp and refreshing features are perfectly balanced with the subtle creaminess and ends with lingering finish. This wine displays upfront guava, pear and pineapple aromas with hints of honey and green apple on the nose. The palate is vibrant and fresh with a linear acidity and a lingering finish. Prized 5-star brandy, ceremoniously matured in French oak for five years. Ripe apple, pear and raisin flavours which are enhanced by a mild toasted oak aroma. A vintage brandy, matured in oak barrels for 10 years, and bottled at 38% alcohol volume. With a deep amber colour, KWV 10-Year-Old contains complex, dried-fruit and port-wine aroma, enhanced by subtle spicy and nutty flavours. 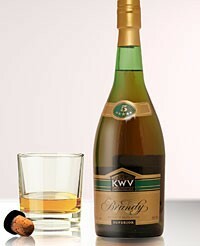 KWV 10-Year-Old is full-bodied, with a lingering, fruity, and slightly sweet finish. Imoya is a blend of pot-stilled brandies, which have been maturing in selected small French oak barrels for between three and twenty years. Dried fruit, toasted, spicy nuttiness. Dried fruit, nuts and wood. Full bodied with lingering aftertaste. Muscadel flavours and hints of caramel. The wine is fresh, fruity and well balanced. Enjoy all year round lightly chilled or over crushed ice. Beautiful dark berry flavours are complemented by caramel, butterscotch and nuttiness. The wine is well balanced, fresh and fruitful with a lingering finish. Serve chilled before a meal or after a meal with cheese. Tinta Barocca, Ruby Cabernet, Souzào, Pinotage. This superb Very Old Sherry winning a double gold medal at the 1996 Veritas Awards has partly been matured in the traditional Criadera/Solera system producing a harmonious and well-matured sherry. The Criadera imparts the delicate and typical flor yeastiness while the Solera ensures a smooth, full character with a pleasant, nutty flavour which finishes with a hint of dryness on the aftertaste. Using an advanced blending process, Wild Africa combines fresh, fine cream with carefully distilled spirit, yielding a light textured, easy drinking cream liqueur and ensuring a shelf life of at least two years for each bottle. This means that refrigerated Wild Africa Cream doesn't thicken or separate like other cream liqueurs. So it's much wilder for longer!